​​​​How does Au Pair Legend work? The app is completely free to download and use. Host Families pay a small monthly fee to chat with Au Pairs. Is Au Pair Legend an agency? No, Au Pair Legend is where Au Pairs and Host families meet. 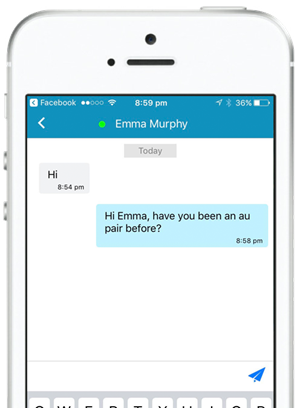 It is a super easy-to-use app where Au Pairs and Host Families find each other and communicate. An Au Pair is a young adult, usually between 18 and 30, from another country that lives with a Host Family for a period of time. The Au Pair is considered as a full family member during their entire stay and will help out with the childcare and some light household tasks. See our blog for more info... What does an Au Pair do? What is a Demi Pair? Demi pairs are like Au Pairs, they live with the family, work a maximum of 20 hours per week and study or work in their spare time. Usually they only take four to six month placements with families because of their studies and are only available in the major cities. See our blog for more info... What is a Demi Pair? Does an Au Pair get paid? Yes, the host family will provide an Au Pair with pocket money. It varies according to your working hours and the country you are in. Is Au Pair Legend safe to use? Tap Cancel Subscription to cancel your subscription. If you cancel, your subscription will stop at the end of the current billing cycle. If you're still having trouble please contact us at hello@aupairlegend.com and we can help you cancel your subscription. Will Au Pair Legend help me with my visa application to USA? No, all Au Pairs who wish to travel to the USA are required by law to contact one of the designated Au Pair agencies before entering the country. The agency takes care of the formalities for the J1-visa au pairs need to apply for. Au pairs and host families pay for the services provided by these agencies. Use Au Pair Legend to pre-match with a Host Family in USA then contact one of the designated Au Pair agencies together. Can i get a visa for Australia? Can i get a visa for the UK? Can i get a visa for America?